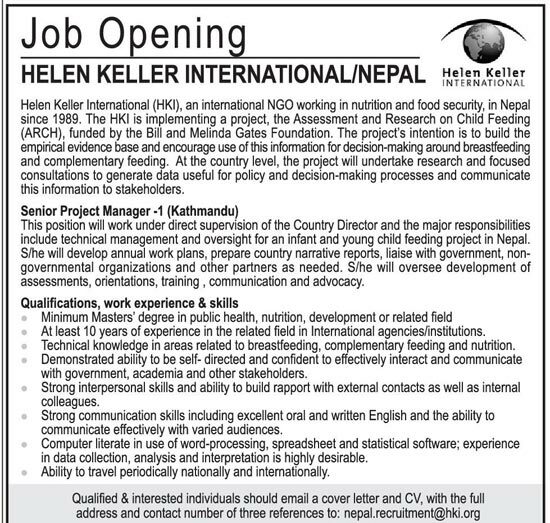 Helen Keller International (HKI), an international NGO working in nutrition and food security, in Nepal since 1989. The HKI is implementing a project, the Assessment and Research on Child Feeding (ARCH), funded by the Bill and Melinda Gates Foundation. The project's intention is to build the empirical evidence base and encourage use of this information for decision-making around breastfeeding and complementary feeding. At the country level, the project will undertake research and focused consultations to generate data useful for policy and decision-making processes and communicate this information to stakeholders. This position will work under direct supervision of the Country Director and the major responsibilities include technical management and oversight for an infant and young child feeding project in Nepal. S/he will develop annual work plans, prepare country narrative reports, liaise with government, non-governmental organizations and other partners as needed. S/he will oversee development of assessments, orientations, training , communication and advocacy.